Which Wood Species Works Best On Floating Stairs? Modern Staircases & Railings / Which Wood Species Works Best On Floating Stairs? The best wood species to use on your floating stairs is one that will hold up to daily use, is structurally sound, and is also breath-taking. The best species for you to choose will depend on your sense of style and the nature of your project. White oak is Viewrail’s number one choice for floating stairs wood species. But remember, nature is not uniform, so your wood will not always be either. White oak contains a lot of movement in its grain pattern; there are cathedrals as well as light and dark spaces that make blending in nail marks and hiding wear easy. 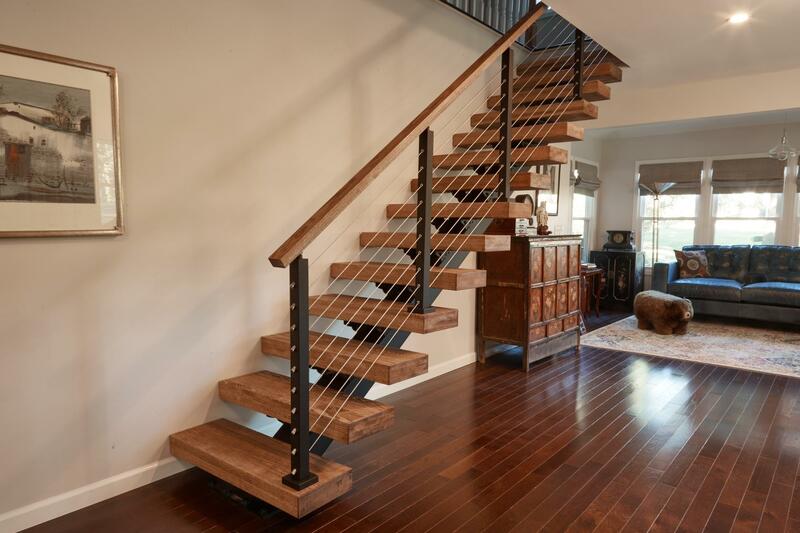 This level of variation makes white oak absolutely stunning on Viewrail floating staircases, and often pairs quite nicely with natural hardwood flooring and design accents. However, if you’d like to use something a bit more uniform on your FLIGHT, we recommend hard maple. The following chart will give you some quick facts about each of these species, as well as their rating on the Janka scale (the Janka scale assigns each wood species a rating for its hardness out of a maximum 4000). Quartersawn white oak is Viewrail’s number one recommended choice for thick stair treads. Quarter-sawing produces stable wood while also creating a linear grain pattern that looks amazing on the front and back edges of your thick treads. Pairing quarter-sawing with the strong, domestic white oak produces a dimensionally stable tread that also happens to take stain extremely well. All Viewrail wood species will add a beautiful, premium look to your FLIGHT floating stairs. There is no need to worry about making the “wrong” choice because Viewrail only offers the highest quality products. If you’re interested in learning more about how much floating stairs cost and what FLIGHT could look like in your space, you can get a quote for floating stairs on the top menu bar. Or, if you’re feeling creative, you can use our “build your own floating stair” tool to create a virtual staircase. Do you want to talk to an expert about customizing your project? Have any more questions about wood species or floating stairs? Give our experts a call at 1(574) 742-1030.